After hair removal, your legs may have look spotted as the result of enlarged pores. This is especially true when waxing or sugaring your legs since these methods pull hairs out by the root. Body acne is another reason that the pores on your legs may appear larger than normal. Although it is not possible to physically shrink pore size without a long wait, you can ensure that your pores appear smaller by using techniques that hide their actual size. Cleanse your legs daily with an over-the-counter exfoliating wash. Exfoliating washes will remove the top layers of dead skin and remove blockages that are stretching your pores, according to CareFair.com. 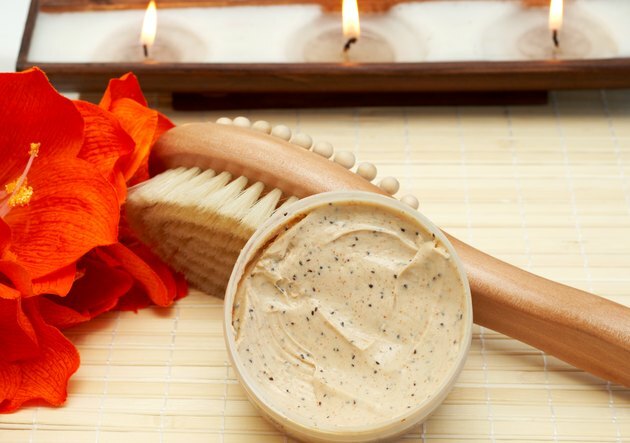 Opt for exfoliating cleansers containing crushed almond, oats or orange peels. Apply an alpha hydroxy acid based lotion to your legs once daily, suggests "The Doctors Book of Home Remedies." Alpha hydroxy acids are natural fruit acids that help to remove dead skin cells that accumulate around each individual pore. Purchase lotions that contain 10 percent glycolic acid for optimum benefits. Purchase an over-the-counter antioxidant serum. When used daily these serums increase collagen production within your skin, according to CareFair.com. In turn, your legs will look smoother and pore appearance will diminish. Application frequency and method depends on the brand that you choose as these serums contain different ingredients based of manufacturer. Consult your dermatologist for microdermabrasion treatments. This is a deep exfoliating technique that stimulates your skin and removes dead skin cells and pore-clogging debris, according to CareFair.com. At-home kits are also available at your local beauty supply store.